The Evergreen Christian Science Church is located just a 1/2 mile north of the heart of Evergreen, and warmly welcomes the community to our Sunday Services and Wednesday Evening meetings. 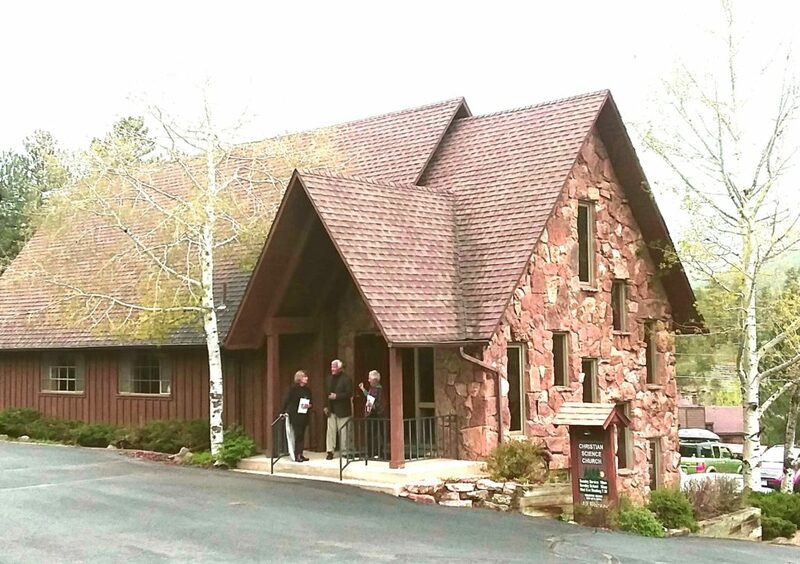 Regular attendees come from as nearby as the surrounding neighborhood to as far as from beyond the Continental Divide to enjoy the friendly, healing, “come as you are” atmosphere of this rustic little church. On Sundays, two church members serve as “Readers,” to read a sermon from the Bible and the Christian Science Textbook, Science & Health with Key to the Scriptures, written by Mary Baker Eddy. It’s a peaceful, reflective hour, brimming with inspiration. Our Wednesday Evening Meetings offer attendees a chance to share healings and inspiration brought about through their study of Christian Science. These testimonials include the healing of physical problems, relationship challenges, financial crises and much more. It’s a much-anticipated midweek “pause” for contemplation, sharing and inspiration. Our downstairs Sunday School welcomes kids from pre-school age up to 20 years old at the same time as the Sunday Church Service. Here they learn to discover and develop their own innate spirituality. Dedicated teachers use the Bible and Science & Health along with age-appropriate learning tools, and encourage lively discussions with older kids to help them learn of their unique relationship to a loving, “Father-Mother” God.